Herman Epstein, a pioneer specialist in the field of sports medicine, was recognized as one of the leading orthopedic surgeons in the world. He is the author of the highly regarded treatise, “Traumatic Dislocation of the Hip”. 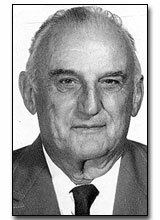 Epstein taught and had as his intern/resident Dr. Robert Kerlan, who went on to become California’s “Father of Sports Medicine”. There was viturally no field of “sports medicine” when Dr. Epstein began to treat athletes. His interest in sports medicine stemmed from a collegiate football career, starring three years at the center position for UCLA. He played for the Bruins from 1926 to 1928, and was their biggest lineman at 213 pounds. Dr. Epstein helped work his way through USC Medical School by playing center for the San Francisco Olympic Club teams of 1930 and 1931. The S.F. Olympic Club was a semi-pro forerunner to professional football on the West Coast. Dr. Epstein’s initial venture into sports medicine was twelve years as the team doctor for Hamilton and Los Angeles High Schools--where he could also watch his sons play football. He returned to UCLA to help many top athletes overcome injuries and rebuild strength. In what he calls his “heyday”, his diagnosis, treatment and care resulted in saving many an athletic career.